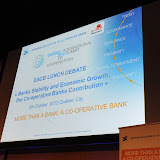 Organized in conjunction with the 2012 International Summit of Co-operatives, the EACB lunch/debate took place on the 9th October in Québec and focused on “Banks Stability and Economic Growth: The Co-operative Banks Contribution”. During this luncheon, the results of a new study conducted by Oliver Wyman were unveiled in avant-première by Veronique McCarroll, partner at Oliver Wyman. This document , a follow-up of a 2008 study entitled “Co-operative Bank: Customer Champion,” provides an outlook on the role and contribution of co-operative banks to the financial sector and to the wider economy by considering the strengths , the specificities and challenges ahead for this distinct business model. The debate was also marked by the interventions of Christian Talgorn, EACB President and Monique Leroux, Chair of the Board, President& CEO of Desjardins Group. In the light of this new study, about 80 high-Level participants and leading representatives of co-operative banks shared their vision on the future of the co-operative banking sector. Pictures of the event available below.